While building a green economy is often discussed as a distinct goal from investing in broadband or overcoming the growing digital divide in our society, new communication technologies are actually a critical part of making our energy-hungry economy more sustainable and energy-efficient. 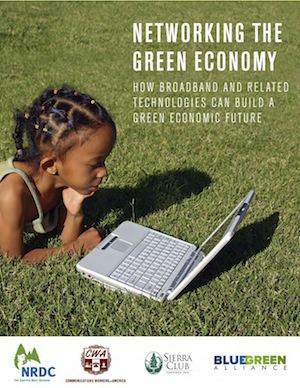 Speed Matters, along with our partners at the National Resources Defense Council, Sierra Club and the Blue Green Alliance, have released a joint report Networking the Green Economy: How Broadband & Related Technologies Can Build a Green Economic Future. 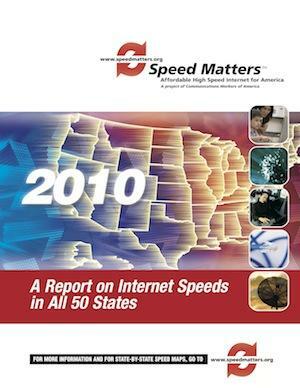 The results of this fourth annual Speed Matters survey of Internet speeds show that the U.S. has not made significant improvement in the speeds at which residents connect to the Internet. The median download speed for the nation was 3.0 megabits per second (mbps) and the average upload speed was 595 kilobytes per second (kbps). 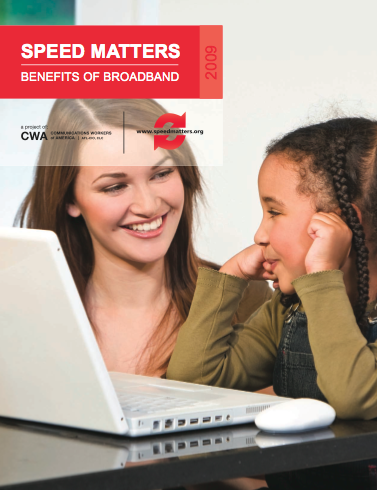 The "Benefits of Broadband" document is a compilation of fact sheets detailing the benefits of affordable, high-speed Internet for all Americans. 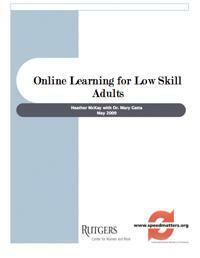 The "Online Learning for Low Skill Adults" report released by the Rutgers University Center for Women and Work and the Communications Workers of America's Speed Matters project documents the ways that innovative use of information technology—personal computers and high speed broadband—can be cost-effective in helping working adults expand their skills and move beyond entry-level jobs. 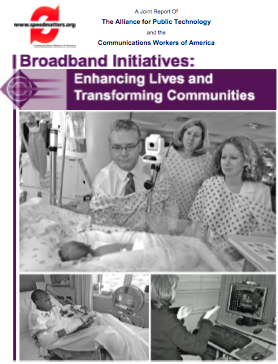 This report documents speciﬁc examples of communities using high speed broadband to tackle local problems and maximize available resources. Some of the highlights include students in Iowa who use broadband technology to share live interactive learning with their peers in Singapore; expectant mothers in rural Arkansas who receive advanced prenatal care from specialists in Little Rock over high-speed networks; and ﬁrst responders in our nation’s capital who have instantaneous access over wireless broadband to an unprecedented amount of critical information so they can protect us better. Speed Matters: Affordable High Speed Internet for All provides working definitions of open internet and high speed broadband. The Policy Paper also gives examples that illustrate why each are necessary; identifies some of the consequences resulting from our failure to enact a national policy for universal internet access and the importance of such a policy for jobs and quality services; and gives examples of other countries that have successfully implemented national policies. The paper includes a list of specific policy recommendations. 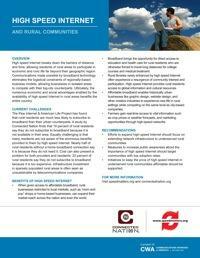 A one-page fact sheet produced with Connected Nation that explains the current challenges, benefits of and recommendations of using high speed Internet to allow rural communities to participate in economic and civic life far beyond their geographic region. 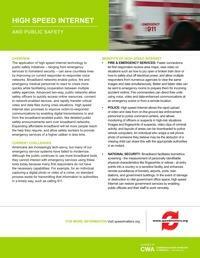 A one-page fact sheet that explains the current challenges, benefits of and recommendations for using high speed Internet to improve public safety. 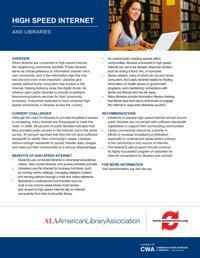 A one-page fact sheet produced with the American Library Association that explains the current challenges, benefits of and recommendations for using high speed Internet to improve libraries. 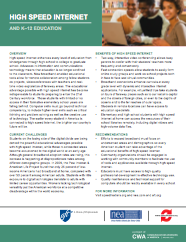 A one-page fact sheet produced with the National Education Association and American Federation of Teachers that explains the current challenges, benefits of and recommendations for using high speed Internet to foster K-12 Education. A one-page fact sheet produced with National Caucus and Center for Black Aged Inc. and Alliance for Retired Americans that explains the current challenges, benefits of and recommendations of using high speed Internet to allow senior citizens to live independently, improve their quality of life, increase participation in economic and civic life and reduce costs of medical care. A one-page fact sheet produced with the American Telemedicine Association that explains the current challenges, benefits of and recommendations for using high speed Internet to improve health care. 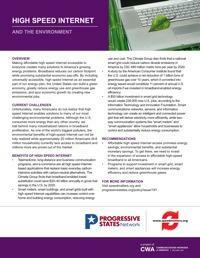 A one-page fact sheet produced with the Sierra Club, Progressive States Network and Blue Green Alliance that explains the current challenges, benefits of and recommendations for using high speed Internet to conserve energy and the environment. 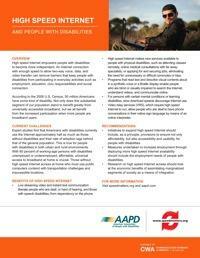 A one-page fact sheet produced with American Association of People with Disabilities that explains the current challenges, benefits of and recommendations for for using high speed Internet to enable people with disabilities. 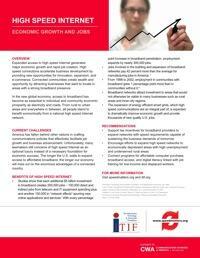 A one-page fact sheet produced with the Information Technology and Innovation Foundation that explains the current challenges, benefits of and recommendations for using high speed Internet to foster economic growth and create quality jobs. 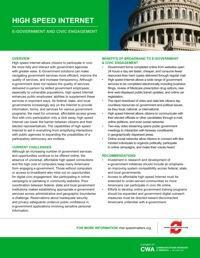 A one-page fact sheet that explains the current challenges, benefits of and recommendations for for using high speed Internet to improve e-government and increase civic participation. 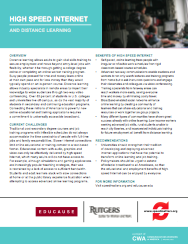 A one-page fact sheet produced with the Rutgers Center for Women and Work and Educause that explains the current challenges, benefits of and recommendations for using high speed Internet for distance learning. 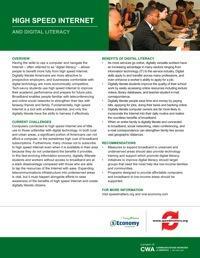 A one-page fact sheet produced with One Economy that explains the current challenges, benefits of and recommendations for using high speed Internet to increase digital literacy. A one-page fact sheet produced with the Alliance for Digital Equality that explains the current challenges, benefits of and recommendations for bridging the digital divide.